How Big was That? Equivalent Energy Released by Bombs, Earthquakes, Volcanoes and Starquakes. | Chaos Sweeps Away the World We Know! The Disaster, current events & Catastrophe Blog. Forecasts for 2014 to 2022. Read tomorrows news today! Plus current economic, commodities, stock indices and financial news. ← Picture of the Day – Mount Moran in Autumn. June 26, 2014 – How Big Was That? 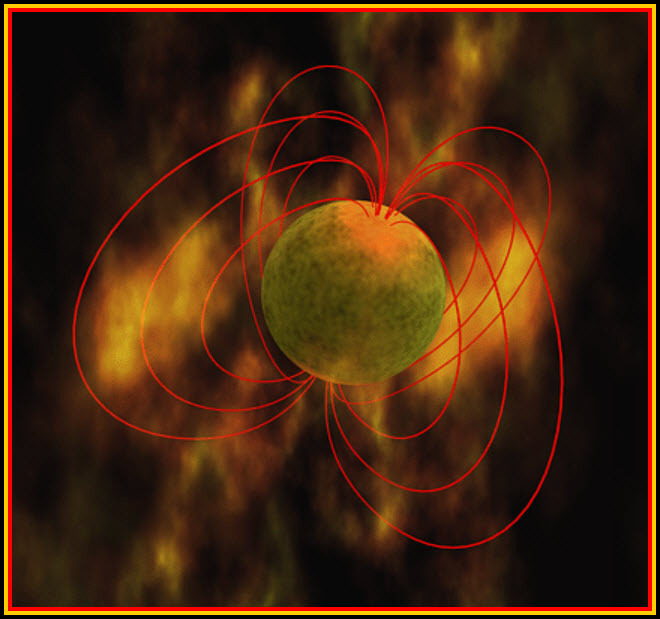 Equivalent Energy Released by Bombs, Earthquakes, Volcanoes and Star Quakes: Pictured above is an artist’s rendition of a neutron star named SGR 1806-20, which is located about 50,000 light-years from Earth in the constellation of Sagittarius. It has a diameter of no more than 12 miles and rotates on its axis every 8 seconds. However, it is at the end of our odyssey into equivalent energy releases and explosive force. For example, the Hiroshima Atomic Bomb blast was equivalent to 13 kilotons of TNT; which is equivalent to a 6.0 magnitude earthquake! The difference is that an atomic bomb releases most of its energy into the air, while an earthquake releases energy into the ground. Nevertheless, the explosive power, or energy release, is the same. Some basic measurements: 1 kilo = 2.2 pounds, one kiloton (KT) equals 2,205 pounds, 1,000 kilotons =1 megaton (MT), 1,000 megatons = 1 gigaton (GT) and 1,000 gigatons = 1 teraton (TT). For example: 1 megaton (MT) of TNT, when converted to kilowatt-hours, produces enough energy to power the average American household for 104,000 years. Here are various earthquake (EQ) magnitudes (M) versus the equivalent energy released: (1) A 6.0M = 15 KT = the Hiroshima Atomic Bomb, (2) 7.0M = 480 KT = Haiti 2011 EQ, (3) 8.0M = 15 MT = San Francisco 1906 EQ, (4) 8.4M = 50 MT = the largest thermo nuclear weapon (Hydrogen Bomb) ever tested (Russian), (5) 8.8M = 200 MT = Krakatau 1883 volcanic eruption, (6) 9.0M = 480 MT = Japan 3/11/2011 EQ and tsunami, (7) 9.2M = Alaska 1964 EQ and Sumatra 12/26/2004 EQ and tsunami, (8) 9.5M = 3GT = 5/22/1960 Chile EQ (the largest ever recorded by modern equipment), (9) 13M = The meteor impact 65 million years ago that wiped out the dinosaurs, and (10) 32M = the largest recorded star quake on SGR 1806-20 (pictured above). A starquake is an astrophysical phenomenon that occurs when the crust of a neutron star undergoes a sudden adjustment, analogous to an earthquake on Earth. Starquakes are thought to be caused by huge stresses exerted on the surface of the neutron star produced by twists in the ultra-strong interior magnetic fields. The largest recorded starquake occurred on the ultra compact stellar corpse (magnetar) SGR 1806-20, which is the most magnetized object ever seen by astronomers. It has a magnetic field 1,000 times stronger than our Sun. The Sun also has “earthquakes.” Seismic waves produced by sunquakes can shake the Sun to its very center, just as earthquakes can cause the entire Earth to shake. However sunquakes involve much more energy than their terrestrial counterparts. An observed sunquake, which was produced by a perfectly ordinary solar flare, was equivalent to an earthquake of a magnitude 11.3 on the Richter scale. That is 89,000 times more energy than the devastating 1906 San Francisco earthquake, at a magnitude of 8 on the same scale. Scientists remain somewhat perplexed about how such a relatively modest flare could have the downward thrust and power to generate such powerful seismic waves. This entry was posted in Astronomy, Earthquake, Events, Explosions, Misc, Miscellaneous, Nature, Neutron Star, News, Review, Star, Stars, The Universe, Volcanoes and tagged 1906 san francisco, 65 million years ago dinosaurs wiped out, alaska earthquake 1964, astrophsical phenomenon, atomic bomb, bombs, charles richter, chile earthquake 1964, dinosaur extinction, earth, Earthquake, earthquakes, energy, energy release, equivalent energy, equivalent energy released, explosive force, gigaton, haiti earthquake, hiroshima atomic bomb, hirsoshima, hydrogen bomb, Japan, japan earthquake march 11 2011, killowatt, kilotons, kilowatt hours, krakatoa, kraktau 1883, largest thermo nuclar weapon, magnetar, megaton, meteor impact that killed the dinosaurs, most magnetized object, neutron star, Nuclear weapon, Quakes, Richter magnitude scale, richter scale, russian, safittarius, sagittarius, san francisco 1906 earthquake, san francisco 1906 fire, seismic waves, sgr 1806-20, solar flare, solar flares, star star quake, starquake, stellar corpse, sumatra earthquake and tsunami 2006, Sun, sunquake, sunquakes, teraton, The Master of Disaster, the sun, tnt, TNT equivalent, tremor, tremors, ultra-strong magneetic fields, volcanic eruption, volcano, volcanos. Bookmark the permalink. 2 Responses to How Big was That? Equivalent Energy Released by Bombs, Earthquakes, Volcanoes and Starquakes. Considering nature’s violence, it would seem that man has a proper role in the universe and is presently doing everything to live up to that role. Cheers.